Dear reader, for any type of concrete, strength is a very important parameter which is related to other parameter too. Say a strong concrete have more density i.e. have less void and low void produce a durable concrete in all respect. In our previous post we have discussed about density and water-cement ratio of no fines concrete and we know this have low density having large size voids. Obviously this will produce weak concrete and we have already defines them as light weight concrete. 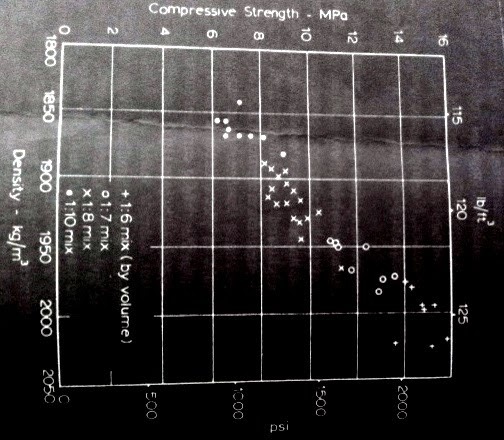 The compressive strength can be achieved with this concrete usually varies from 200 to 2000psi (1.5 to 14 Mpa). The range is large and depends mainly on density of concrete mass. The density depends on cement content. Unlike normal concrete, this concrete is less dependent on water/cement ratio in respect of strength development. Dear reader we have discussed about optimum water cement ration in last post. The rate of strength development of no-fines concrete is usually identical as that of normal concrete. Regarding flexural strength, we can include, this is 30% of its compressive strength. This value is comparatively higher than that of normal concrete. The modulus of elasticity has direct relation with strength say for concrete of 700 psi this value is 1.3X106 psi (10 Gpa).